8 January 2017 | ANTANANARIVO, MADAGASCAR –The Director-General of WHO has outlined his vision for a Madagascar free of plague epidemics during a three-day visit to the island nation that started on 7 January 2018. 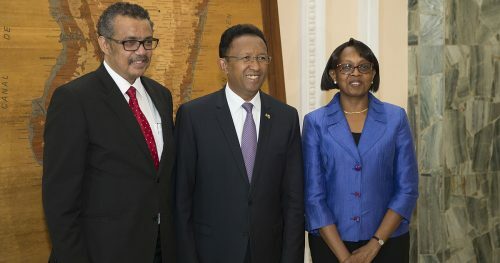 “Madagascar can make plague epidemics a thing of the past through strategic investments in its health system – including better access to healthcare, improving preparedness, surveillance and response capabilities, and implementing the International Health Regulations,” said Dr Tedros Adhanom Ghebreyesus. “This unprecedented pneumonic plague outbreak was contained due to the tireless efforts of Malagasy health workers and partners. WHO will continue to support plague preparedness, control and response, and we call on our international development partners to help us end human outbreaks. This will include better understanding of the wider factors that allow plague to spread, and strengthening national capacities to manage similar emergencies in the future,” said Dr Tedros. ports and airports. More than 4400 people were trained to identify, refer and care for close contacts of plague patients to prevent the disease from spreading. “With support from WHO and other partners we provided treatment to nearly all identified plague patients and more than 7300 contacts free of charge,” said Dr Lalatiana Andriamanarivo, Minister of Health of Madagascar. The International Federation of the Red Cross and Red Crescent Societies, the Malagasy Red Cross, Institut Pasteur Madagascar, Médecins Sans Frontières (MSF), Medecins du Monde (MdM), the United Nations country team (including UNICEF, UNFPA, UNDP), USAID, Action Contre la Faim, the Global Outbreak Alert and Response Network (GOARN) partners, including the alumni network (EAN) of the European Programme for Intervention Epidemiology Training (EPIET), the Indian Ocean Commission (OIC), Public Health England, the Robert Koch Institute, Santé Public France, the Chinese Center for Disease Control and Prevention, the United States Centers for Disease Control and Prevention (CDC), and other partners are actively supporting the government and health authorities in Madagascar.